Villa Baan Paradise is a gorgeous double-storey, 5-bedroom luxury villa perched on a hilltop in the most happening town of Thailand's Phuket. 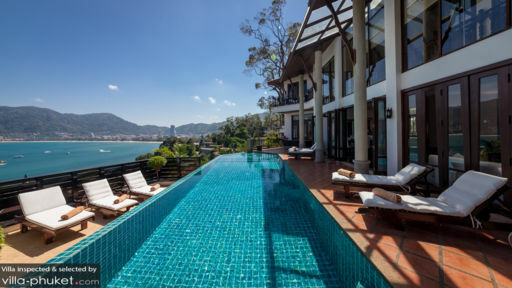 This stunning hilltop villa features a glorious infinity pool that enjoys a 180 degree panoramic view over Patong Bay and the azure blue ocean. 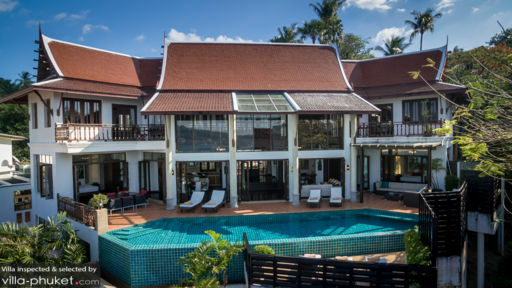 With inside and outside dining areas, modern entertainment facilities and 5 villa suites, villa Baan Paradise is a dream come true for large groups of people seeking luxury and top quality service on one of the most popular tropical islands in Thailand. The master of master suites is found on the first floor of the pavilion, adjoined by a private balcony with an amazing view over the ocean. This luxurious bedroom features a deluxe king-size bed, a satellite TV with DVD-player, built-in wardrobes and an opulent en-suite bathroom fitted with a Jacuzzi bathtub and a rain-shower. The villa has 3 more deluxe bedrooms which could be taking for master suites, looking out onto the bay of Patong, providing you with an enchanting view to wake up to every morning and a magical view of a thousand sparkling lights in the evening. These king-bedded rooms feature elegant interior designs ruled by teak wooden furniture, TVs with DVD-players and writing desks. Each room has a private en-suite bathroom fitted with a bathtub. The 5th bedroom is found in the basement, adjoined by the entertainment room. This room features a double and twin bed, making it a perfect family room and it comes with a private en-suite bathroom. The garden of villa Baan Paradise features a stunning 14 meter infinity edged swimming pool that looks out onto the bay and the ocean. The pool is equipped with spa jets for a relaxing back massage in the water while gazing at the view. After a refreshing dive and a jet massage, you can sunbath on the teak timber sun-beds reading a book while catching that gorgeous tropical tan and occasionally sipping from your delicious home-made cocktail. BBQ facilities are also available. Designed with a warm wooden floor throughout the property and decorated with beautiful original artwork, antiques and rich fabrics, villa Baan Paradise breathes sophistication and class. There are comfortable sofa's for day-time lounging and there is a circular dining table for 8. You never have to miss out on the spectacular ocean view as the living room has been designed with full length glass doors that slide open to the pool-deck. 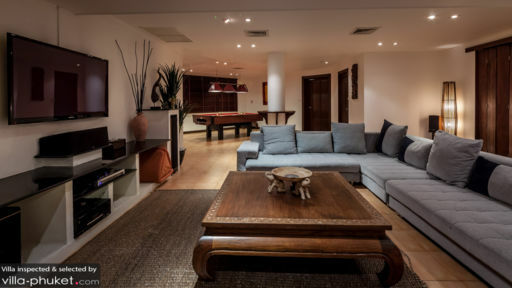 The villa has its own entertainment room, complete with a 60-inch flat-screen TV, a DVD-player, surround-sound speakers and a Playstation II as well as an American pool table, promising great fun for young and old. The villa comes with 2 fully equipped kitchens to provide you with snacks and drinks the whole day through. The villa has two friendly maids looking after you during your stay, making sure everything is perfectly suited to your wishes. The villa manager will be there to greet you upon arrival, happy to advise you on what to do and where to go and answering all of your questions. Wifi is available throughout the property. Guests staying at villa Baan Paradise enjoy magical views over the ocean while experiencing full tranquillity within the estate. It comes as a nice surprise therefore, that it is just a short 3 minute walk to the beaches, restaurants, café’s and night-clubs of Patong, offering you the best of both worlds indeed! Patong is the most famous and popular beach resort town of Phuket with a vibrant night-life. The sea is great for snorkeling and diving and there are also lots of watersport activities for the adventurous ones.